In an effort to increase efficiency and maximize profit, Amazon has implemented picking robots in its warehouses AKA “Fulfillment centers” (FCs). Amazon currently has more than 80,000 automated robots in its warehouses globally. Picking robots are wheeled robots that pick up racks full of products transport racks around a FC. Currently wheeled robots are built by company Kiva (bought by Amazon in 2012). 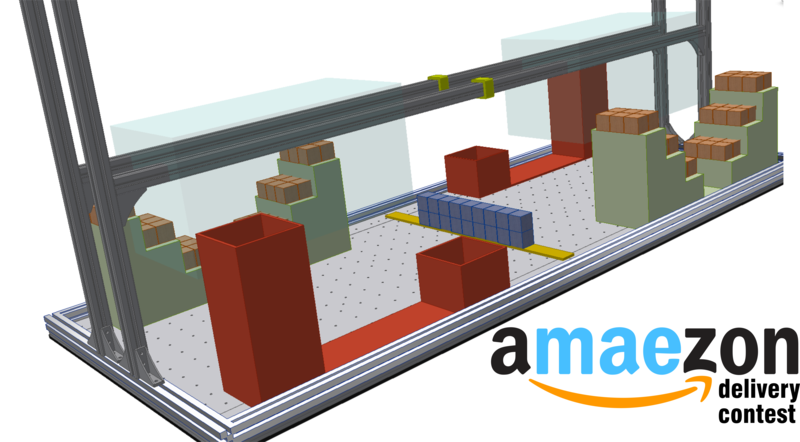 In an effort to obtain more advanced robots, Amazon has imitated a design challenge. They have offered $250,000 reward for better robots for their warehouses. In other words, FC robots are all ready working. . . And getting better. The NEW challenge is delivering the packages to peoples' homes!!! MAE3 Students will design robots that can pick up packages from warehouses and deliver them to homes (i.e. Scoring zones!!). The contents of some packages are more valuable than others, so student earn more points for delivering them successfully; Brown packages are worth more than blue. Likewise some delivery areas are more difficult to access (deliver packages to). The easiest delivery area is a flat communal receiving area (Scoring Zone B). Some customers want their packages delivered directly to their homes. There are two home types, low rise (Scoring Zone C) and high rise buildings (Scoring Zone A). Since high rise buildings are more difficult to access, these scoring zones are worth more points. Two robots will compete head to head for 60 seconds. Robots will try to collect as many packages as possible and drop them at the apartment complexes (scoring zone). All scoring will be done at the completion of the contest after all parts have finished moving. To qualify as "inside the scoring zone": at the end of the 60 seconds, a portion of each package must be within the vertical airspace of each zone and not contacting the table. Note: Blocks will still count if they are in or ontop of the robot, as long as they are within the vertical airspace, and the blocks are not contacting the table. Robots must fit entirely within a 10x10x18in starting box at the start of the competition in the locations show above. Robots must start in the air but nothing prevents robots from lowering to the ground when the competition begins. The two rails are spaced 7in apart and are 15in above the playing field (see diagrams above). Detailed dimensions of the rails are given below. Note: there are stoppers clamped to the rails at the center of the playing field. In the case of a tie, the team who placed the first package in their scoring area wins the tiebreaker.